You’ve probably seen our state-of-the-art color-coded shortcut keyboards for Adobe, Blackmagic, and AVID software products. But you can actually have your very own custom-made shortcut keyboard created for your proprietary software, and the process is quite simple really. We will build a keyboard from your artwork or help you with the graphic design and production of a personalized shortcut keyboard, branded with your company logo. Our in-house controlled production enables us to Flexible and Swift turnaround time from idea to finished product. We offer customized keyboards for both PC and Mac. Phase One came to us with the desire to design a shortcut keyboard for Capture One 10. Designed with the world's most demanding photographers, Capture One Pro combines outstanding power, image quality and precision - Phase One wanted the same quality hardware as their state of the art software and choose us. After months of hard work in the design process we eventually ended up with the beautiful Capture One 10 keyboard for Apple's M89 keyboard. AVID shortcut keyboards and Logickeyboard goes way back. Our partnership started over 15 years ago when AVID came to us with the desire to build the best custom shortcut keyboard in the world. In close collaboration, we have designed shortcut keyboard for AVID Media Composer, AVID Pro Tools, AVID Sibilius and AVID Newscutter. The Media Composer shortcut keyboard was actually one of the first shortcut keyboards to hit the market, and the idea of working with color-coded keys and shortcut references was hereby born. EditShare's Lightworks is an Oscar & Emmy award winning professional-grade video editing system with over 20 years of history in the film & broadcast industry. 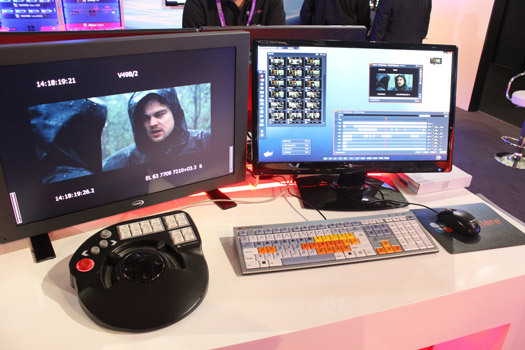 In the summer of 2011 EditShare decided on LogicKeyboard to supply The Lightworks Open Source Project with shortcut editing keyboards. EditShare and LogicKeyboard created a good working relationship in making the best possible editing keyboard solution - each sharing and exchanging ideas and building upon each others experience in editing and graphic design. The first public appearance happened in September 2011 at the IBC Conference and Exhibition show in Amsterdam. EditShare showed the Lightworks Open Source and it was demonstrated with the use of the EditShare Lightworks shortcut keyboard.